Muscles enable the various movements animals perform, from the heart pumping blood to leg muscles allowing ambulation. Muscle contractions are powered by mini-motors called sarcomeres, and muscles use differences in cell morphology, gene expression and alternative splicing to build sarcomeres with different contractile properties. Loss of factors responsible for alternative splicing causes muscle diseases such as myotonic dystrophy and dilated cardiomyopathy, indicating that splicing factors are essential to build healthy muscle. The goal of my group is to understand the function and mechanisms of alternative splicing in muscle development, and how these are altered by disease. Building on my previous work with the splicing factor Arrest, we are working to determine the mechanism of CELF-family alternative splicing factor function in vivo and how this leads to muscle phenotypes characteristic of myotonic dystrophy. 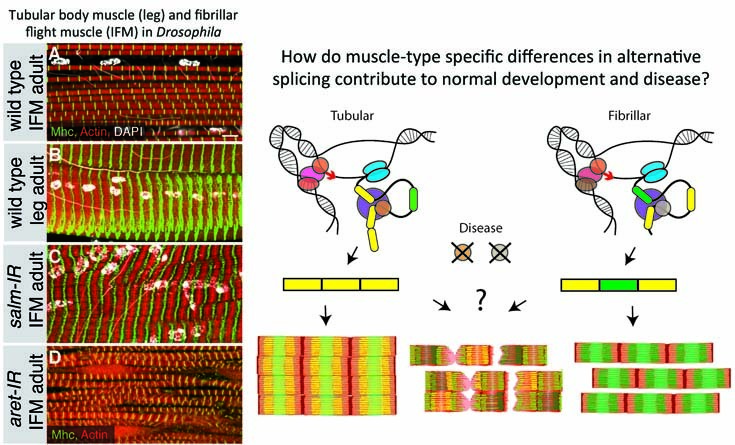 We are also interested in identifying Arrest cofactors developmentally, both expanding the number of identified muscle splicing factors and further characterizing how splicing contributes to normal muscle development. In addition to Arrest, we are working to systematically identify splicing factors and characterize Arrest independent mechanisms regulating splicing in muscle. We are doing this both through a characterization of developmental splicing changes in a 10-point mRNA-Seq time course and using forward genetic screens in Drosophila. Our work will clarify how alternative splicing works, how healthy muscles are built, what role alternative splicing plays in myogenesis, which proteins regulate alternative splicing and how the normal splicing process is disrupted in vivo in splicing diseases. Our work serves as one of the first systematic approaches to understand how alternative exons are selected in a tissue-specific manner in vivo. Our results would be a significant advance towards identifying a complete list of splicing factors in a single tissue and understanding the mechanisms guiding tissue-specific alternative splicing. As alternative splicing is a general process, our results will also likely uncover general mechanisms applicable to splicing function and diseases in other tissues. Our results in Drosophila will be directly relevant to understanding mechanisms of pathogenesis in human muscle disease, as well as conserved mechanisms of muscle development and sarcomerogenesis.